Animated gifs were popular in the early days of the Internet (the mid 1990’s) which is when I designed my first Juggling website while studying Information Management at Abertay University (Dundee) as part of my coursework. For that website, I had a page featuring juggling animated gifs I had found on the internet. The page took ages to load (everywhere was still on dial-up speeds back then), but it was one of the more popular pages on the website! Over the years since I have collected a few more animated gifs here and there, and to celebrate the relaunch of my website in March 2013, I thought it appropriate to bring these gifs out of retirement for your enjoyment once again! Let’s start with the only one I have ever created for myself – this is my juggling logo, and this dude appears as my signature on most documents I sign! Now that you are all fired up, we continue by looking at a few of my favourite’s before I unleash the rest which range in quality from excellent to extremely annoying! How to do a head-roll. You need to keep watching this one to work out what is happening! Shall we skip the rest, or do you want to keep going? Please note that I sought permission at the time to use most of these animations whenever possible, but if you notice one that shouldn’t be there, please just politely ask me to remove it! 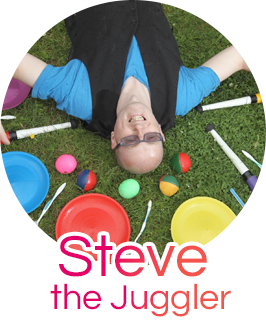 If you have found (or created) any more juggling gifs, then please contact me and I will be happy to add them. and as happy as these Comedy Legends.